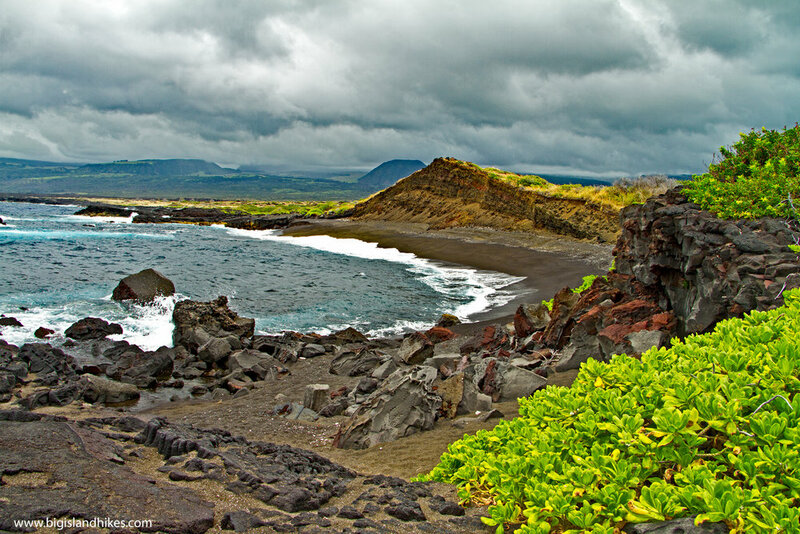 This is a long southern coastal hike that begins at popular Punalu'u Black Sand Beach and travels along the seldom-visited lava expanse of the Kaʻū coastline to deserted Kamehame beach. Along the way are a number of cultural resources, most notably Kāne'ele'ele Heiau, one of the largest luakini heaiu (temple for human sacrifice) on the Big Island. Puna luʻu means fresh spring that is dived for in the Hawaiian language because the ancient inhabitants of this part of the island would dive with gourds to fill with fresh water in the bay's springs. Punalu'u is one of the most popular black sand beaches on the island of Hawai'i although it's not the best for swimming. Kamehame is another black sand beach flecked with green olivine and is the premier nesting area for the endangered honu'ea (Hawksbill turtle) and honu (green sea turtle). Turtle nesting season is from June to November, and you should avoid all turtle nesting sites completely during this period and even avoid Kamehame beach in general. Both species of sea turtles and all sea mammals are protected by both federal and state law, and you should maintain a twenty-five foot buffer from these species. This long Kaʻū hike guarantees solitude. Trailhead: On Hwy. 11 northeast of Naʻālehu and southwest of Pāhala, turn makai (toward the sea) between the 55 and 56 mile markers on Ninole Loop Road. Follow Ninole Loop Road to Punalu'u Beach Park. This public park is open 24 hours per day and has free parking. There is drinking water, showers, restrooms, camping sites with electricity, and lifeguards during the peak hours of the day. Gear: Bring plenty of water and sun protection. The terrain is quite rough the further away from Punalu'u that you hike, so sturdy boots are a good idea. Hike: Before departing for your hike, walk to the restroom area and look sharp for several faded petroglyphs carved into smooth rocks. Unfortunately, many more ki'i pōhaku (petroglyphs) were destroyed when the parking lot was paved. From the parking area, walk east to Punalu'u Black Sand Beach and hike around the bay between Punalu'u fishpond toward some poured concrete boat ramps on the other side. Honu, green sea turtles, often bask in the surf here and you should give them a very large buffer of at least twenty-five feet when they are present. When you reach the poured concrete boat ramps, locate a faint trail heading uphill. There are more than one in the area, but the one closest to the boat ramps offers the easiest access to the lava bench above. Climb about fifteen feet up this faint trail and encounter Kāne'ele'ele Heaiu. Meaning the darkness of the father god, this enormous ancient site measures some 500 feet wide by 700 feet long. Evidenced by a large, flat "sacrificial stone," this heiau was the luakini (human sacrifice) temple for the district. Kāne'ele'ele Heiau is in disrepair but the temple walls are still obvious for most of the foundation. You can also often find a wooden lele offering stand on the heiau and even some other religious offerings. You should leave no trace, touch nothing, and stay off any temple walls. 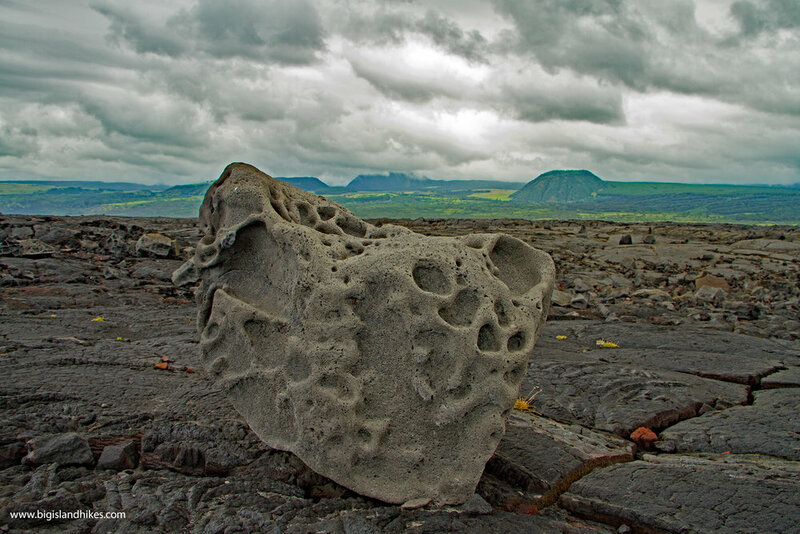 On the other side of the heaiu, locate the ancient Ala Kahakai trail, marked by flat, polished stones amid the lava destruction. The Ala Kahakai once provided an easy path around most of the coast and parts are still visible in many other areas of the Big Island. This trail is easy to follow nearly to Nahuluhulu Point. There are a few places where it is overgrown or washed away by the sea, but in general, you should be able to follow this ancient trail for at least a mile. Eventually, you'll encounter a grassy road near the sea. Follow the grassy road for a bit until it leads to a lava expanse. This old road is marked by white coral markers as it crosses rough lava flows from Mauna Loa. The "road" eventually fades near a large lava crack, and you'll need to make your own way from here. Speaking of lava cracks, you'll encounter countless deep cracks as you hike, some with standing water. These cracks aren't from earthquakes -- they are formed when lava is forced from below and cracks the surface at once. The lava around these cracks can be unstable, so give them plenty of respect and stay away from the edges. Hike near the coast, sometimes on old trails and roads toward Kamehame. Pu'u Kamehame, the eroded cinder cone that marks the beach, should be visible on the horizon. The National Park and The Nature Conservancy maintain a few rudimentary structures for monitoring turtle breeding at Kamehame beach, and you should obviously stay away from this private property. Honu'ea and honu breeding season is between June and November, and if you hike here during this period you shouldn't hike across Kamehame beach because it is one of the most important breeding sites on the Big Island for these endangered species. If it's not turtle season, you still need to give this black-and-green sand beach plenty of respect. The strong current and waves here create a very steep beach and a relatively small bay. Swimming here is inadvisable and even hiking across the steep beach requires your strict attention. If you cross the beach, you'll find two lava arches in the small bay on the other side of Kamehame. Leave No Trace and retrace your steps back to Punalu'u.